Amazing Weightloss Success Stories From Sunshine Customers Could Easily Fill 20 Pages, Check Out These Six! Sunshine Customer Is Fired By His Doctor! 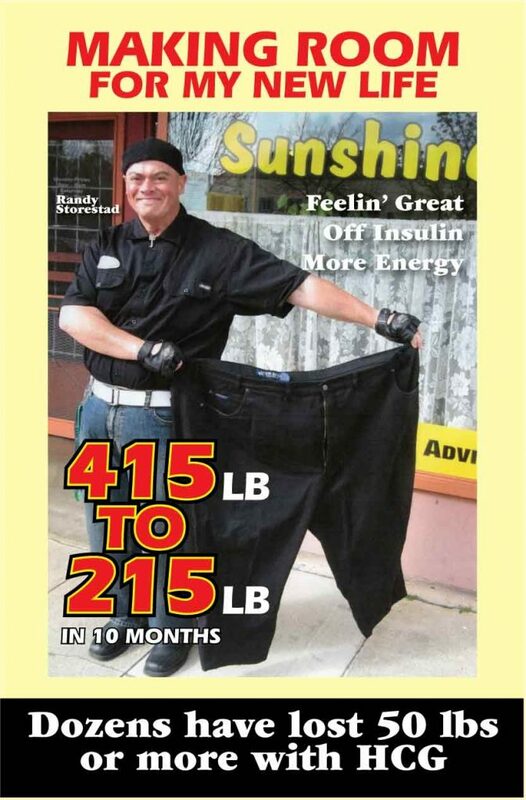 At 415 lbs., 44 year old Grants Pass resident Randy Storstad was shocked the last time he visited his doctor. The doctor told him that if he didn’t lose weight, he would refuse to see him again! Randy took the message to heart and realized the doctor was right: weightloss needed to become a top priority his excess weight had become life-threatening. Randy was not optimistic and felt his chances of losing weight were “slim to none”. Soon after, Randy’s sister told him about the HCG diet plan she had purchased at Sunshine. One of the first things Randy noticed while taking the HCG drops following the diet was that he was not particularly hungry. In fact, he found the diet easy to stay on. He did notice that he needed to drink plenty of water and that was stated in the instructions. In his first 6 weeks carefully following the diet and using the HCG drops Randy lost an astonishing 61 lbs. During the required 6 week break from HCG using the Slim Support formula he lost another 26 lbs.He recently finished his fourth round of the plan and has now lost 201lbs. in 10 months! Randy feels great, sleeps better and has more energy! His blood sugar has dropped by about one third and he has discontinued prescription insulin. Randy’s goal was to be under 200 lbs, He’s a changed man, hopeful, happy and only 14 lbs away from reaching his target weight. Congratulations Randy! Evelyn Baily, 63 years old from Grants Pass Oregon, was overweight, on prescription blood pressure and diabetes medications and had no energy. Wherever she went she was looking for chairs to sit down and rest. She began the diet program along with the HCG drops. Evelyn started seeing results almost immediately and after following the program for 7 months lost an astonishing 96 lbs, and was able to discontinue her medications. That is definitely weightloss success! She monitors her blood pressure daily and it now measures around 112 over 70. Her blood sugar is around 80 and most importantly….She Feels Fabulous and Has Tons of Energy! Losing Weight and Off Insulin In Less Than A Week! Sixty year old Williams resident Dayna Hurd found herself 100 lbs overweight and dependent on daily use of insulin to control blood sugar. Fortunately, her Medford based physician recommended that Dana go to Sunshine Natural Foods to purchase and use the HCG drops and diet to try to bring her weight down. The first week Dayna lost 9 lbs., her blood sugar normalized and she was able to discontinue her insulin use. After 2 weeks Dyana had lost 24 lbs., had more energy and “was tickled to death” at how easy it was to lose weight using this protocol. Dana lost 40 lbs. during her first 6-week round of the dropsa and diet and is now taking the required 6-week break. She plans to do another round soon. Dayna has more energy, feels great and is losing about a pound a day. She said that the HCG diet was the easiest weightloss plan she’d ever tried and said that she’s “tried em all”. Grants Pass Realtor Is Healthier Than Ever! Woman Finds Solution For 60 Lb. Weight Gain! Several years ago Patty Eide was faced with the medical double whammy. For health reasons she underwent a hysterectomy and quit smoking. Unfortunately she gained over 60 lbs. Patty tried 4 nationally known weight loss programs and even went on a raw food and juice diet for 2 years all to no avail. Her friend told her about the HCG diet plan available at Sunshine. Understandably, Patty was skeptical, after all, she had been unable to lose significant weight despite diligently following virtually every well known weightloss program. Using the HCG diet system Patty has lost 19 lbs in the first 17 days. She is now enthusiastic, bursting with energy, has lost inches everywhere and looks forward to shopping for new clothes. 66 year old Tom Altamont from Tacoma Washington was enjoying a very active retirement when he was involved in a minor car accident. He sustained no serious injuries but back pain forced him to cut way back on physical activity and he gained about 40 pounds. TV in a recliner was about the only “activity” that he could do without pain. The more weight he gained, the more the pain increased. Tom’s sister lives in Grants Pass and has been a Sunshine customer for years. She had great success with the our HCG diet program and told Tom who then ordered it from the Sunshine website. Tom carefully followed the program and lost 20 lbs the first 14 days. He ended up losing nearly 40 lbs and five inches off his waist in six weeks. Tom sleeps better, has been able to discontinue his prescription pain meds and has far more energy. He is now back to walking about 40 minutes a day and he is maintaining his weightloss. Tom said the next time he visits his sister he’ll stop in to thank us in person.